Triple chocolate truffle cookies recipe is an irresistible treat for the ultimate chocolate lover. Semi-sweet, bittersweet and unsweetened chocolate make for a fudgy cookie with a crisp meringue like exterior that dissolves with each bite. What happens when a cookie, brownie, and chocolate truffle meet at a bar? Magical things my friends. If you LOVE chocolate, then this recipe is for YOU, yes I mean it. What I’ve got is three types of chocolate, each adding a special something-something to the mix, plus a small touch of espresso for a little pick me up. This triple chocolate truffle cookies recipe is slightly addicting, one bite and you’re trapped in a gooey chocolate trifecta. Yes, please! Curious to know what three types of chocolate made the cut and why? I used Ghirardelli Chocolate because I enjoy the taste and quality. Ghirardelli is made in the San Francisco Bay Area not far from my hometown, so I’ve also got a little locale loyalty. The key is the type of chocolate and the effect it gives in the cookie. For a pure earthy cocoa flavor, unsweetened 100% cacao chocolate bar is chopped up and melted. Bittersweet 60% cacao chips happen to be my chocolate of choice, delicious and seductive. Semi-sweet chocolate chips, typically found in chocolate chip cookies are left whole and folded into the batter. This helps to balance the flavors and give you a lingering cocoa taste. The first step in this recipe is to melt a big bowl of luscious chocolate with butter, so you know it’s going to be good. The cookie base combines two kinds of dark chocolate, and instant espresso to enhance the chocolate flavor. The molten mixture is then stirred into whipped eggs and sugar. The lightened eggs give the outside of the cookie a crisp meringue-like texture, that melts instantly in your mouth. The flour and semi-sweet chocolate chips are then folded in. What you get is a thick brownie-like cookie batter, I bet you can’t wait to see how these bake up! Oh yeah, see the crackly crisp exterior? What’s inside is even better! You want to slightly underbake these cookies, so they stay moist and melted in the center, and the bottoms don’t get too tough. When you take them out of the oven, they will look a bit shiny and cracked, but won’t feel completely set if picked up. That’s what you want. Cool the cookies on the sheet pan, so it has some time to cook a bit more and have a fudgy filling. 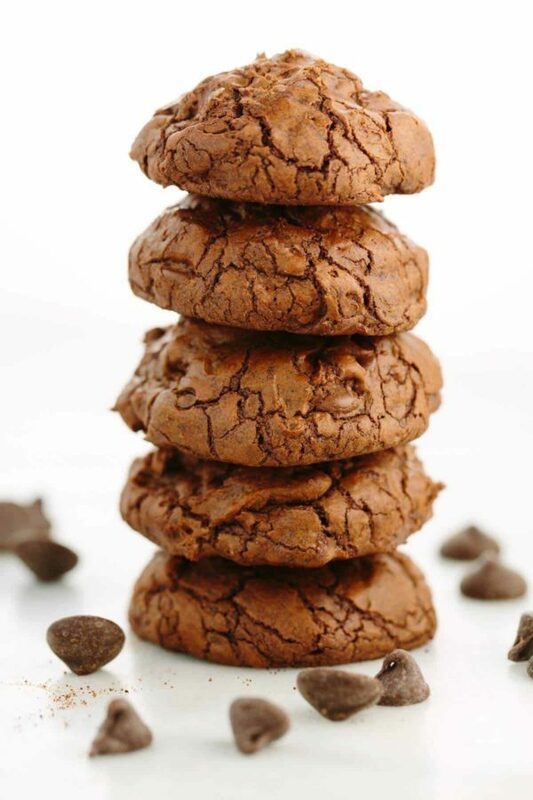 Thick, warm, clouds of chocolate heaven all in one irresistible cookie. Will you share with friends? You will be praised if you do, but I also understand if you are a little selfish just this one time and stash them all for yourself! Meringue cookie on the outside, brownie on the inside with gooey chocolate chips just waiting for the right person. Don’t wait, just bake! I’ve gotten into the habit of sharing what I make with our friends Erica, Erwin and baby Harper who live down the street. When I dropped off these freshly baked cookies, they immediately cracked open the Tupperware container to give them a try. Let me tell you, I’ve never seen cookies disappear so fast, they were two jubilant parents, ha. Enjoy friends! What is the difference between unsweetened, semi-sweet and bittersweet chocolate? Melt unsweetened chocolate, bittersweet chips, and butter in heatproof bowl set over a saucepan of simmering water stirring frequently, until completely smooth and glossy. Remove bowl from pan and set aside to cool slightly. Stir coffee powder and vanilla extract together in small bowl until dissolved. Beat eggs and sugar in large bowl with electric mixer at medium-high speed until very thick and pale, about 4 minutes. Add vanilla-coffee mixture and beat until incorporated, 20 seconds. Reduce speed to low, add chocolate mixture, and mix until combined, about 30 seconds. Whisk flour, baking powder and salt together in medium bowl. Using a large rubber spatula, fold flour mixture and semi-sweet chips into batter. Cover bowl with plastic wrap and let stand at room temperature for 10 to 15 minutes until batter firms up. It will more closely resemble thick brownie batter than cookie dough. Meanwhile, adjust two oven racks to upper and lower-middle positions and heat oven to 350°F. Line two large baking sheets with parchment paper. Using 1 heaping tablespoon batter per cookie. Place cookies 2 inches apart on prepared baking sheets. Bake until cookies are shiny and cracked on top, 11 to 12 minutes, rotating baking sheets top to bottom and front to back halfway through baking time. Transfer baking sheets to racks and cool cookies completely, on baking sheets before serving. Store in an airtight container for up to 3 days. It’s a cookie and a brownie at the same time. My new favorite! So good! Thanks for giving the recipe a try Robert. I’m eager to try these cookies – looks like a brownie in cookie form or a variation on a chocolate crinkle. I’m a little dubious whether it will have the chocolate kick I like, since the recipe doesn’t use cocoa powder. I’ve found that recipes only using melted chocolate don’t give me that deep chocolate punch that I expect when eating a chocolate brownie or cookie. I’m not a huge coffee fan, so I was considering substituting cocoa powder for the instant coffee, but not sure if it’s enough to make a different – or it might dry them out. What do you think, Jessica?